A CSA is a symbiotic relationship between the farmer and the group's members. The farmer pledges to produce the best products he or she can for the members and the members pledge to support the farmer through their shares. There is no corporation, no middle man, no one coming between the farmer and the members. 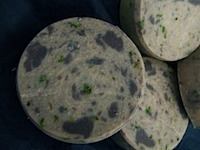 Because of this, the members receive the finest, freshest products without the markup. What better relationship is there? To know where your food comes from, how it is produced, the care and thought that goes into the production and that your dollars are making an intimate circle between what you and your family eats and the farmer who makes it happen. Your local farmer spends his dollars in the community at the local feed mill, at the hardware store, lumber mill and even the Main Street barber. In other words, your dollars stay in your community and continue to support the people around you for far longer than the time it takes to write that check. When you purchase from the large retailer, your dollars leave the community for corporate headquarters and trickle down very slowly back to where they came from. The effects are not immediately visible as in the farmer to member scenario. 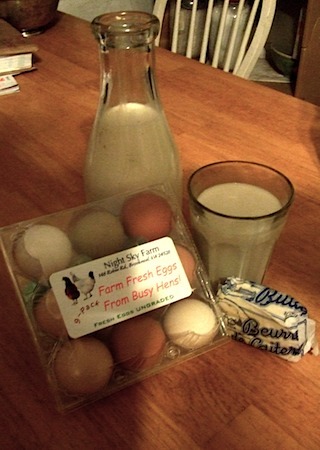 Night Sky Farm is now offering a limited number of CSA subscriptions. I call it the Total Farm CSA. Each subscription is for a duration of 13 weeks (3 months). 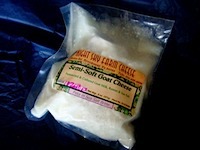 Your weekly CSA Share for a family of 4 can consist of 1 gallon of Raw Milk (goat or cow; on a contract Herd Share. 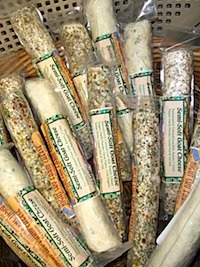 You are not obligated to purchase a Herd Share with the CSA Share), Fresh Eggs from our Happy Hens, Cow Cheese and/or Goat Cheese, Cow or Goat Butter, cut flowers or fresh herbs, Pastured Chicken, Naturally Raised Rabbit, Goat Milk Fudge and even our PATTI CAKES! 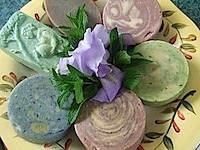 Bath & Body products and WASH TIME Eco-Laundry Soap. You can create your own CSA share! Not all products are available at all times, some need time to grow. Already, I am working on adding chevon or goat meat to our offering. As we grow, so will our product list. Our products speak for themselves. They are superior to any found in the grocery store. All are hand-crafted with the finest ingredients and we produce them from the beginning; we feed and manage the dairy herd, milk the animals and then offer you our Grade A milk and pasteurized butter and cheese. Our chickens are fed all-natural feed and allowed to roam within their enclosure. Enclosures are moved to different parts of the pastures on a rotational basis. 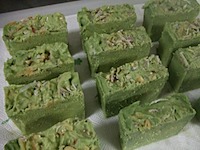 The chickens are able to peck for bugs and worms, dine on fresh green grass and be out in the sunshine. Same is true with the rabbits, though they do live in smaller cages, they are raised humanely and are fed alfalfa hay and all-natural rabbit pellets. Both are sold whole. The cost of a 13 week CSA Share without the Herd Share is $325. In other words, a Total Farm CSA Share entitles the member to a $25 personalized order each week. You may order as often as weekly or as infrequently as monthly. Milk Shares must be picked up or delivered each week. The 3 month CSA Share with a cow Herd Share (value $84) costs $409 and with a goat Herd Share (value $108) the cost is $433. Again, you are not obligated to purchase a Herd Share. Subscriptions are pre-paid by the session or by the month and due when your session begins or the first day of every month. Herd Share contracts are renewed every 13 weeks. We accept cash, check, M.O., Mastercard or Visa. 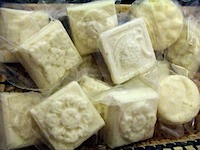 CSA Orders can also be made monthly and shipped anywhere in the USA in an approved shipper. Shipper cost would be shared and return postage refunded the next shipment. All farm offerings except milk can be shipped. So, even if you do not live near enough to pick up your share in person, you can still enjoy Night Sky Farm products and support sustainable agriculture. 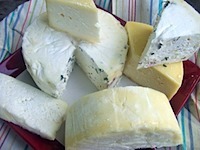 This is a great opportunity to gift a CSA subscription to the person who "has everything" and they enjoy our fabulous cheese and other items every month. Members must choose one item per Group of Night Sky Farm products as they are available and as the member desires. 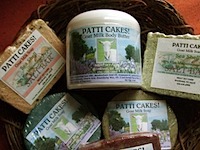 Need PATTI CAKES! 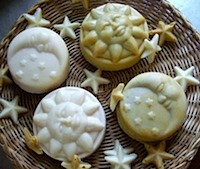 Body Butter, Goat Butter and 2 of our chevre one week and a WASH TIME Eco-Friendly Laundry Soap, 2 dozen Fresh Eggs and Feta the next? You can do that! Sound intriguing? 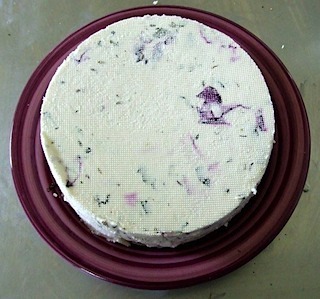 Flavors: Naturally Plain, Chive & Garlic, Herbes de Provence, Pomegranate Orange, Lavender Lemon, Cracked Pepper, Kalamata Olive. 1 Whole Rabbit - ave. 3 lbs. 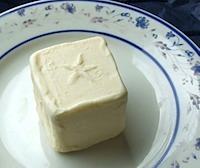 1 Goat Butter - 6 oz piece when avail. 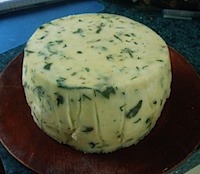 100% Jersey Cow Butter - 8 ozs. total when avail. Group 1 items are valued at $8.00, Group 2 at $7.00 and Group 3 at $10.00. If you wish to order more than the offering you may, the overage would be paid when you pick up or receive your week's order. 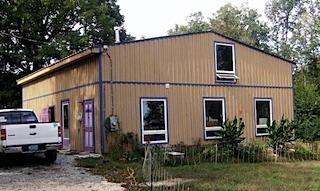 As a member, you would email your order into Night Sky Farm the Sunday before your pick-up day and then arrive on your assigned day at the farm on either a Tuesday or a Friday (half of the members will be scheduled to pickup on Tuesdays and the other half scheduled for Fridays) to get your complete order of milk and farm products. Delivery of your order for a fee may be possible Saturdays to Richmond and also to the Tidewater area, South Boston and of course, Lynchburg. It is preferable, of course if the member picks up at the farm. The 13 week commitment begins when you buy your CSA subscription. Winter CSA subscriptions (1 December to 1 March) will be very limited because that is when we have the least amount of milk available and I do need to meet my wholesale customer's needs. Please read the section on our Herd Share Program. The Herd Share part of this CSA subscription is identical to our regular Herd Share Program, except that the duration is for 13 weeks instead of 6 months. You will need to buy a share at $50 which is a one time non-refundable charge per year and is renewed for each subsequent 13 week subscription offered during the year. The Herd Share is non-transferable. So, if you purchase one 13 week subscription with the Herd Share and you decide that was long enough; you do not get a refund on your Herd Share. Though, if you love the session you experienced or you wish to have a herd share again later in the year, you do not pay for another Herd Share.